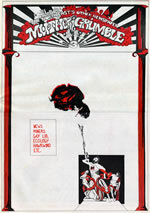 Muther Grumble existed for around 2 years between 1971-1973 it was produced by a motley group of people consisting of students, workers, the unemployed, trade unionists, pensioners, hippies, artists etc, etc. - anyone who wanted to be involved could be. Its aim was to give a voice to the people of the North East and act as a link between the many varied community/self-help groups which were springing up throughout the region at that time. The money for the first issue was put up by journalist working on a local newspaper who was frustrated at not getting stories of local government corruption published in his paper. The first issue was produced by four anarchist/hippies who were soon joined by a fluctuating band of people (as above) who assisted in keeping it going for 2 years. At the height of its growth 8,000 copies per issue were being produced. Business know-how was not one of the strengths of the publishers and eventually money problems forced Muther Grumble to close. The website, which was begun at the start of 2003 was designed to show what Muther Grumble was all about and give people today a chance to sample its contents (much of which is still relevant today). The website has been a minor success and last month received 26,000+ hits. In fact more people in the 21st century have read Muther Grumble than ever did in the 1970's! Were YOU involved with Muther Grumble? Were you a contributor, reader, street-seller, part of the production team or whatever - email your memories and we'll add them here.